I had the delightful task of test driving two skeins of Victory Ranch’s Handspun Alpaca(www.victoryranch.com) and giving an honest review. My experience with alpaca includes working with mill processed, commercial alpaca yarns as well as hand spinning alpaca fleece from Winslow Farm, an extraordinary animal sanctuary in Norton, MA. Victory Ranch’s skeins are akin to neither, so this was a new adventure. The skeins arrived with photo hang tags letting me know that the chocolate color yarn is sheared from Bacchus–who looks quite adorable and very happy. The creamy white skein is sheared from the lovely Kahuna. So from the very beginning, knitting with this yarn is a very personal experience. It is not anonymous, mass produced, standard issue, same, same, same yarn. What does it look like? Both skeins are soft, smooth, and resilient to touch. The natural colors are beautiful and rich. The diameter of the strand is varied; at first, this worried me. Would this create an uneven fabric or make it challenging for me to maintain a consistent gauge? 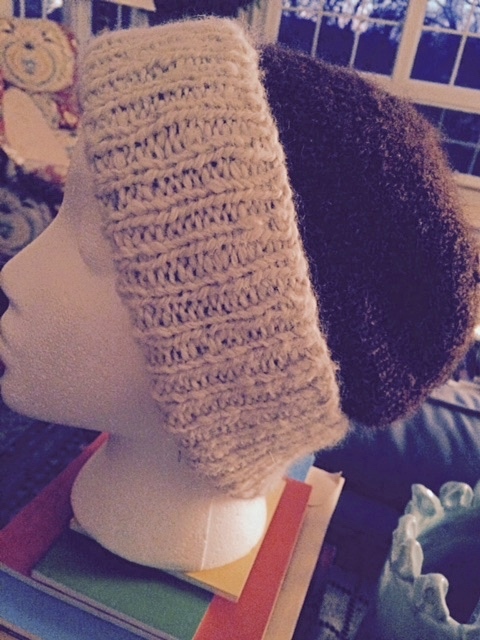 I cast on in Kahuna’s natural creamy white and began 1 x 1 ribbing for a very warm winter hat. 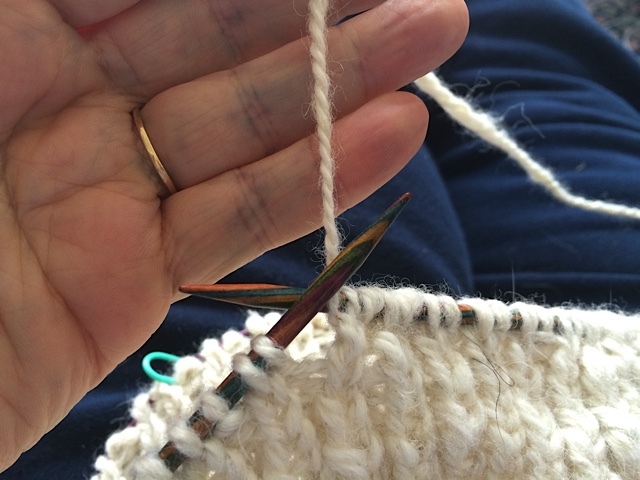 On size six needles, the ribbing emerges. 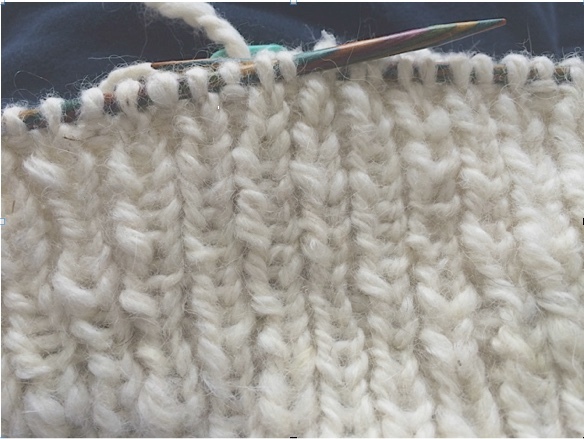 Stitches have clear definition albeit it nubby; the ribbing has elasticity and has character. 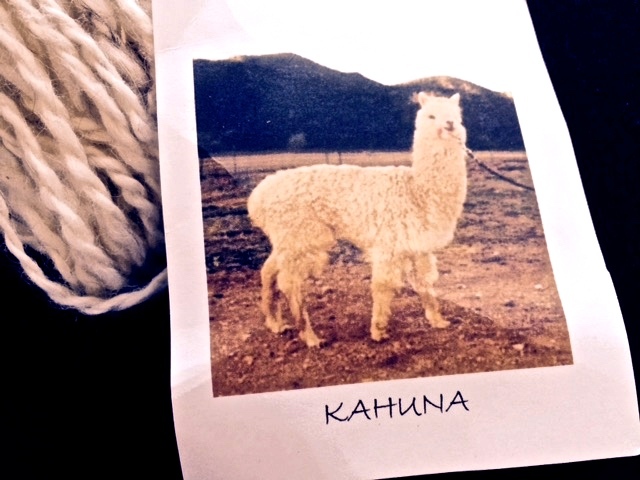 This yarn comes from a real animal, whose picture I can hold in my hand and whose good energy and warmth I can feel. Yes, there was an occasional piece of plant debris that is easily picked out. After three inches of ribbing for an extra warm brim, I switch to Bacchus’s skein and stockinette for the body of the hat. On size six needles, I consistently get gauge at five stitches per inch with this fiber. Stitch definition continues to be excellent. The hand of the fabric says “touch me!” and the yarn is strong as well as flexible and soft. Some stitches are a tad plumper than others, but my objective is never to have my knitting look like it is machine made. The fabric has a gentle drape. The two colors work so well side by side, like organic chocolate and vanilla ice cream. Yummy in all ways! Blocking consists of a long(3 hour) soak in lukewarm water with no-rinse soap. The water does turn grey, and I repeat with a second and then a third soak until the water is clear. The fabric gets even softer, holds its form, and stitches become more balanced. It dries beautifully and holds its shape after lots of use. I always like to compare my experience with what is promised on the ball band. Victory Ranch notes that alpaca yarn is hypo-allergenic; I had no allergic reaction at any point in playing with this yarn. That is a big plus as many of my friends and family are allergic to wool but want the warmth it has to offer. Yes, this hat is warm–the warmest in my multi-hat collection, and it breathes, so that I’m comfortable and don’t have a sweaty head. The label says it’s smooth as silk, and I completely agree, but what I like even more is that it has more “give” than silk and holds its shape. In addition to the technical success of working with this alpaca, I appreciate that this is a one of a kind yarn created by animals I can picture in my head when I wear this hat. These animals are treated humanely and loved. I confess that I now follow the alpaca gang on Victory Ranch’s Facebook page. Best of all, there is more gorgeous yarn from Bacchus and Kahuna’s friends. I can’t wait to play with the chunky weight next. Think of the possibilities…. 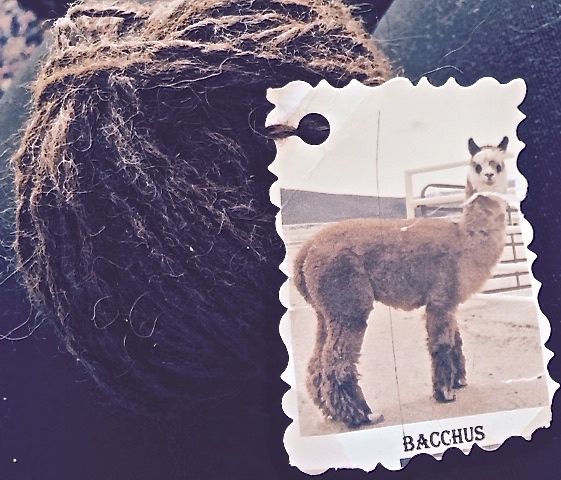 Posted in Uncategorized and tagged Alpaca yarn, Knitting, Victory Ranch. Bookmark the permalink.